Daisies symbolize being fresh, wholesome, and energetic. You can only feel that way surrounding yourself with our Gerbera Daisy print. 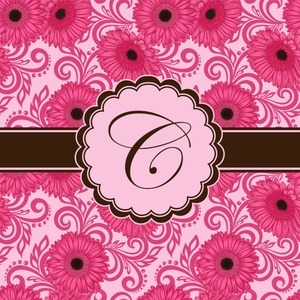 With huge, hot pink daisies on a pale pink background of swirls and dots, this design is absolutely fabulous. In the center of the design is a beautiful scalloped label, the perfect place for the personalization of your choice.